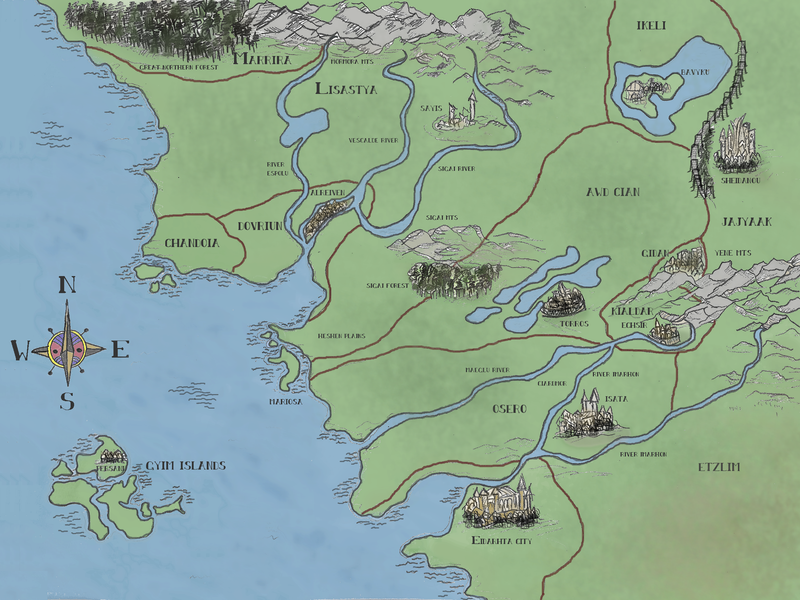 One of my favorite things about reading and writing fantasy is the cartography. I’ve always loved maps. As a curious but somewhat timid and terminally confused child, looking at the big world atlas for school or for fun, they seemed to represent the perfect balance between exotic places that were exciting and unknown to me, and the fact that someone had tamed them, charted them, and pinned them in a book for everyone to see. Someone knew what was going on out there, where all the rivers led and how to get out of the mountains, even if I didn’t, and that was very comforting. My love of history is also, of course, intimately entwined with geography, and since I’m a very visual learner, maps are sometimes the only way I can really understand what happened at a complicated battle or during a particularly convoluted treaty. When I first wrote The Last Death of Tev Chrisini, I took a few hours out of my precious NaNoWriMo time to create a map for my nameless world. I knew there would be a journey involved in my story, so it made sense to want to be able to see where my characters were gallivanting off to. It also helped me clarify how much time it would take to get from place to place, even though the map I eventually came up with isn’t drawn to scale in the slightest. I wanted to put it in the Kindle version of TLDTC, but the image wasn’t working for all formats and frankly, it was kind of amateurish and lackluster, as far as those things go. You can’t talk about fantasy maps without hearkening back to the mother of them all, Tolkien’s gorgeous charts in The Hobbit and The Lord of the Rings, and my map looked like a three-year-old had gotten into the crayons again and decided to scribble with what she didn’t eat. Because let’s face it, I’m not an artist. I can kind of sort of draw simple things, and I can Photoshop fairly well, but I don’t have that innate talent that some people do, nor do I really have the interest and/or discipline to practice until I reach an acceptable level. That’s fine by me. We can’t all be good at everything, right? Basically what I’m saying is please don’t criticize my stray pixels and squiggly lines. I don’t have a tablet, which would have made the whole process so very much easier, and I drew the thing in pencil first before scanning it in and coloring it in GIMP, which means there’s a lot of information that doesn’t get transferred cleanly, due to the fact that graphite is smushy by nature. So it’s not perfect, and it’ll never go on a gallery wall. Oh well. But I think it might be a good idea to publish it somewhere, if only to give people an idea of the geography. It makes the story easier to read. I’ll be keeping a copy of it on the TLDTC page, so just hover over it and a little drop down should say “world map”. Comments, suggestions, etc. welcomed. I hope it’s helpful. I love maps too, and I’ve drawn at least two for some of my stories so I know what directions the characters are going, though they’re not drawn to scale. Your map is great! And you did it in color. I’m certainly never going to share mine. Btw, I loved your description of the three-year-old and the crayons! Oh, and I bought some printer paper that’s on the back of cut-up maps. Thanks! I’m such a visual person that maps are a necessity when I’m trying to figure out imaginary geography. Scale doesn’t matter if it’s all in your own head…or at least that’s what I tell myself.